Often times Human Resources' staff is so busy trying to keep up with day-to-day operations that many HR practices and procedures get neglected, which increases company risk levels. Allowing high risk practices to continue can quickly lead to expensive litigation and/or compliance violations. 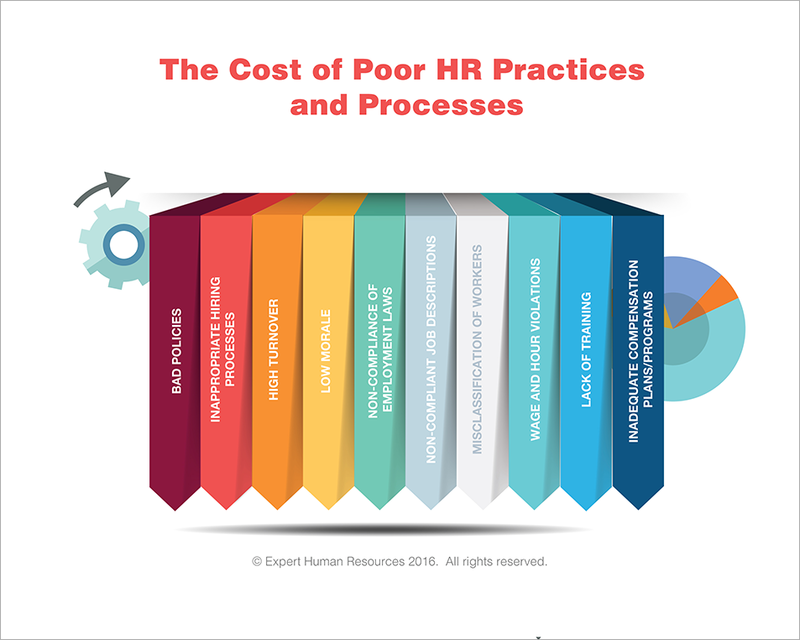 However, human resources practices and policies can result in cost savings for companies by ensuring HR compliance, consistency, and appropriate processes. Certain HR functions can save a business a considerable amount of money. In other words, HR can add to your bottom line through cost-saving measures. Conducting a Human Resources (HR) audit is a smart way to make sure your organization is legally compliant, as well as, uncover illegal processes. The HR audit is the process of examining intensely and objectively the organization's HR policies, procedures, documentation, systems, practices and strategies to protect the organization from litigation, establish best practices, and identify opportunities for improvement. An objective review of the employer's "current state" can help evaluate whether specific practice areas are adequate, legal, and effective. In a nutshell, the HR Audit gives organizations the opportunity to assess what the organization is doing right, as well as how things might be done differently, more efficiently, or at a reduced cost. It also helps the company identify outsourcing opportunities and cost saving strategies. It only takes one disgruntled employee to file a complaint of unfair labor practices to incite a full blown investigation by the IRS, DOL, EEOC, ect. These investigations can interrupt you business as well as be time-consuming and very expensive. Are you prepared? By conducting an HR Audit, you can avoid litigation and non-compliance fines. An HR Audit can also provide an objective look at the company's human resources policies, practices, procedures, programs, and strategies to help not only protect the company from litigation and fines; it can establish best practices, identify opportunities for improvement, and evaluate outsourcing options. HR Audits can ensure effective utilization of HR resources and improve customer service, which in turn can add to your bottom line. "Vanessa is one of the best in the country! I highly recommend her!" Avoid costly fines and litigation for non-compliance. Contact us today! We will work with you to help you effectively utilize your human resource processes as well as establish a baseline for future improvement; which can save you money and add to your bottom line! Call us at (877) 356-6175 or e-mail us Today!